Casalesalento (Residence- Rooms) to 2.5 km from the sea of ​​Salento. A relaxing! Casalesalento (rooms & apartments) is in the heart of the Salento Peninsula, in the protected area "Natural Park of Porto Selvaggio" to ca. 2.5 km from the sea. The cozy building made entirely of tufa stone unique native of this region, fits harmoniously in Salento to give vacation and relaxation. The farmhouse dates back to the 30s of last century, recently and tastefully renovated respecting the architecture and the traditional local houses. The property consists of 2 levels. The first floor consists of 2 comfortable apartments of 110 sqm, of white color, furnished in typical Mediterranean style. Attention to detail has also affected the choice of kitchens, beds, baths and various furnishings. The rooms are all equipped with air conditioning and televisions. All apartments have a kitchen to allow guests maximum freedom. Instead, on the ground floor there are 4 very refined and suggestive housing solutions, all completely independent, with private bathroom and air conditioning, of which: 2 apartments with kitchen, (about 45 square meters) which are composed of 1 bedroom, large and in front enclosed patio-veranda with windows, which represents a comfortable dining area, with inside an equipped kitchen, sink, pots and pans, furnished with table, chairs, fridge and oven, a comfortable and functional solution for couples with max 2 children or nuclei composed of three people. The apartments enjoy a picturesque garden view with a private and independent area, ideal for pleasant moments of relaxation and in complete autonomy and tranquility; 2 bedrooms (without kitchen), which with 1 double bed or 2 single beds can comfortably accommodate an extra bed or a double sofa bed. These two hospitality solutions, equipped with LED TV, minibar, air conditioning, bed linen, bathroom with a large shower, wall-mounted hairdryer and towels; they are ideal for a couple with or without a child or for three people; all adaptable to various types (double / triple), with independent entry keycard with electronic key, gardens of competence, with outside a large wooden pergola area and shading drapes with tables, chairs, deckchairs and sunbeds and overlooking a large park among oaks and eucalyptus trees, palms and other exotic plants. Furthermore, there is a magnificent infinity pool with sun loungers and deck chairs arranged on the whole stone base, surrounded by a lovely garden. In addition, inside the central body of the structure there is a common area equipped with vending machines, tables, chairs, sofas and small armchairs dedicated to the consumption of food and drink or reading. The family environment allows adults to relax and enjoy the tranquility of the place and children play happily and safely within the defined structure from the outside by a dry stone wall typical of stones and rocks in the area that have many stories to tell. FROM 7 JULY TO 4 AUGUST AND FROM 25 AUGUST TO 1ST. APP. WITH 2 ROOMS 4 PLACES € 230 PER NIGHT, 5 PLACES € 240 PER NIGHT, 6 AND 7 PLACES € 250 PER NIGHT. "CASALESALENTO" IN THE MONTHS OF APRIL, MAY, JUNE AND SEPTEMBER WILL OFFER 'FREE TO ALL GUESTS WITH MINIMUM STAY OF 2 NIGHTS AND FOR THE ENTIRE HOLIDAY PERIOD, A BEACH SERVICE WITH 1 UMBRELLA (UNTIL AVAILABILITY AVAILABLE) AND 2 LETTINI AT THE FAMOUS LIDO "SAMSARA BEACH" BY BAIA VERDE DI GALLIPOLI. Guests enter the house along a driveway immersed in the village park. Upon arrival you will be greeted by staff who will carry out the check-in and give them access badge to the rooms that have all private entrance practices. In addition, "Casalesalento" has several common areas such as swimming pool, solarium, gardens, indoor hall and watched videos parks. Staff Casalesalento is always available to make your stay as pleasant as possible while respecting your privacy. The property is situated in the heart of Salento, 2.5 km from the sea. The neighborhood is a small village surrounded by the Mediterranean and close to the Natural Park of Porto Selvaggio, Captain Marsh and marinas of St. Isidore and St. Catherine. And 'it surrounded by the ancient and picturesque farms, typical locations of Salento. The sea, with breathtaking scenery, is only 2.5 km, all major shopping facilities within 3 km as well as the center of the aristocratic Place Saint Catherine, the old town of Nardo and Gallipoli. Lecce, Otranto and Santa Maria di Leuca at 30 ca. minute drive. Visit the Salento is convenient and easy from the basis Casalesalento. TAX OF 1 EURO PER PERSON PER NIGHT SHOULD BE PAID SEPARATELY AT THE TIME OF CHECK IN. Among the best places of Salento, to visit not only in summer but also throughout the course of the year, to admire the magnificent scenery. Pescoluse beach is considered to be the representative of those that are nicknamed "the Maldives" of Salento, characterized by fine white sand and low seabed and transparent. Also noteworthy Torre San Giovanni, considered one of the most beautiful beaches located between Gallipoli and Santa Maria di Leuca. 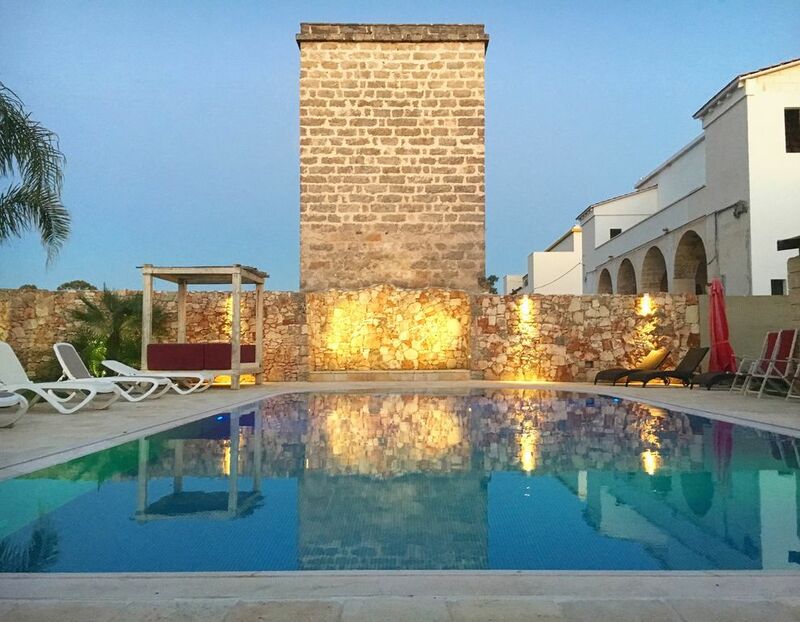 Situated in Gallipoli, this resort from wild charm was preserved perfectly: you can admire the unspoilt nature areas, flanked by golden beaches and crystal clear waters. Free beach characterized by golden and fine sand and shallow and crystal clear, not marred by the excessive presence of bathing establishments. Its blue sea and its golden cordon dune is a real natural paradise. The Punta Pizzo beach is within the Reserve Isola Sant'Andrea. Surrounded by lush pine woods. sandy bays alternate with cliffs. A few kilometers from Otranto, it is said that the beach of the bay would be the landing place of the Turks during the invasion of the city in the fifteenth century. The beautiful landscape that surrounds the strip of white sand that forms the beach of the Bay makes it one of the most popular resorts of Salento. Located within the municipality of Melendugno (Lecce), it is dominated by a cool and thick pine forest. Renowned for the stacks and for the "Cave of lovers". 1. The stay starts from 14:00 will be delivered when the room booked and ends at 11:00 on the day of departure. Upon arrival the guest is asked to fill in the form to check in with all the required data and to settle the payment upon delivery of the keys of the room badge. In case of early departure no part payment will not be refunded. At the start, each guest is asked to leave the room at a preset time. The use of the facility and the pool is only open to guests Casalesalento, so it is limited to guests allow entry to friends or acquaintances who are on site. Use extreme caution in the use of the private pool without staff supervision. The pool is open from 09:00 to 23:00, except for maintenance. It is not allowed to consume food or drinks inside the pool. Casalesalento NOT provide towels for the pool. 4. And 'SERVERAMENTE NO SMOKING INSIDE THE ROOMS! They are provided at check-in: 1 set COMPLETE of bath towels per person, 1 bedroom set. And 'it is forbidden to use outside of such equipment room. The change of towels and bed linen is an extra cost of 5 € per person. The property is situated in the heart of Salento, 2. 5 km from the sea. The neighborhood is a small village surrounded by the Mediterranean and close to the Natural Park of Porto Selvaggio, Captain Marsh and marinas of St. Isidore and St. Catherine. And 'it surrounded by the ancient and picturesque farms, typical of Salento location. The sea, with stunning scenery, just 2. 5 km and all major shopping facilities within 3 km as well as the center of the aristocratic Location of Santa Caterina, the historical center of Nardò, Gallipoli, Porto Cesareo and Punta Prosciutto. Visit the Salento is convenient and easy from the basis of our "Casalesalento" structure.